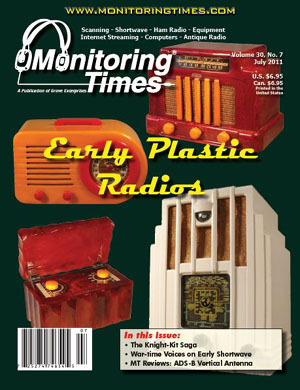 This is the interview about vintage radio collecting that the July 2011 Monitoring Times article was developed from. What was the first radio you ever had? When was that and how old were you at the time? Did you have a mentor, favorite uncle or other older person to guide and influence you? As far back as I can remember, I have always had big interests in radio. I remember my father reciting intros from The Shadow and other early radio programs. I grew up in a house with no television, so radio was my only source of entertainment. As a teenager in the mid '70s, I remember listening to KAAY, Little Rock, Arkansas. At 2am they broadcast "Beaker Theater", airing a variety of early radio dramas each night, including Suspense, Escape, Chandu the Magician, Tom Corbett Space Cadet and many more. I rigged up a timer to a cheap tape recorder and listened to them the next day. Also around this time period, an elderly neighbor gave me my first vintage radio, a 1937 Truetone D911, with a colorful dial and pushbuttons in a beautiful wood cabinet, which is still in my collection. How did you become interested in collecting radios? Was there a seminal moment or particular radio that gave you the initial shove? Since I was given my first vintage radio, I kept an eye open for them, but wasn't actively collecting, until in the mid-'80s, when a friend pointed me to an owner of a storage business, that had a garage filled with antique radios that a customer stopped making payments on. Suddenly, I went from a handful of radios, to an instant collection of over 50. I then began reading and learning all about the radios I just acquired and found that radio collecting was very popular with a large network of collectors across the country. I subscribed to magazines published by the antique radio collecting community to find radios and parts. Collecting radios can be a highly rewarding hobby, with great satisfaction given when you turn the on/off knob for the first time after a restoration and feeling the warm tube sound as you test the reception across the dial. Bringing back an old crusty, delapitated radio that was found in a garage or barn back to it's original beauty and back into a living room centerpiece, will bring such a feeling of pride and satisfaction, not to mention the feeling that you've preserved a piece of history - a radio that might've been destined for the city landfill. How has your collection changed over the years? Have your interests changed as well? I was addicted at this point, searching for radios anywhere I could think of to find them, waking up early every weekend for rummage sales, attending many auctions, and visiting every antique shop I could find. I even posted a newspaper want ad for old tube radios. In the beginning, I was only interested in wood cabinet radios, and overlooked plastic radios, as I was more interested in the history than the design. My interests have shifted over the years, and now plastic radios from the '30s and '40s with machine age or deco design, are my main focus, although wood radios with a nice colorful dial or features can still get me excited. Today, the collection has grown to nearly 500 radios, so space has become a problem, and I've found I've limited my collecting to midget sets. It's natural as a lover of radios to find yourself owning a few different kinds of radios, which then can easily turn into a collection. You then find yourself thinking about the acquisition of more cool radios to look at and play with, and to restore and bring back to life. It's nice to own examples that span the history of radio from the earliest tube radios through the transistor era. But as your collection grows, you quickly find that you have to specialize to an extent as space and other criteria can become a factor. Some collect only early '20s radios while others specialize in just woods or plastics or only transistors, or maybe only Zenith or Fada radios. It seems you will naturally gravitate towards specializing based on memories, or the appreciation of certain features, either style or functionality. Some collectors are purists and insist on everything being original, while others don't mind a rebuilt or repaint if it was well done. How has collecting changed since you began? What affect has eBay and other online points of sale had on collecting? Has it driven prices up? Caused a scarcity? With the advent of the internet came a significant change in the radio collecting hobby. The entire world opened up for the collector, who could now communicate easily with collectors around the country and the world. No longer were you confined to finding radios in your area or traveling to swap meets. I found early radio designs from Australia and France included some exceptional artistic designs, and radios began arriving from around the world. Today, shipping costs have skyrocketed, and have affected what is worthwhile to ship. I also found the internet was a great way to share my collection with the world rather than a few interested friends and collectors. In the mid '90s I built the website ClassicRadioGallery.com, one of only a small handful of websites dedicated to vintage radios at the time. Today their are hundreds of antique radio websites to explore. This was also before Ebay changed the collecting world and I received hundreds of emails from other collectors and people just looking to sell their radios, which led to some great additions to the collection. Ebay completely changed radio collecting and the entire collecting world. Radios, some thought to be one-of-a-kind, were found popping up frequently. Now, sellers could reach more potential customers than ever possible before. Ebay has become the price guide for vintage radios. It has exposed how common some radios are and how scarce others are, some only surfacing once or twice in the last decade. During the recent economic downturn, prices have dropped for the more common radios - prices similar to what you might've found them for at a second-hand shop, whereas it has not affected the incredibly rare radios, which has only seen prices increase. Persuing additions to your radio collection using online auctions can be a real rollercoaster ride, you'll get some great deals; radios better than described and very hard-to-find. Other buys will disappoint, from radios with undisclosed damage and missing or wrong parts, to poorly packed radios that don't arrive in one piece. It's always a good idea to suggest specific packing procedures to the seller. If you are shipping or receiving radios, it seems large bubblewrap surrounding the radio, buried in packing "peanuts" in an oversized box is safest. Bakelite and plastic radios can be very fragile and many collectors insist on double-boxing radios, expecially the expensive catalin radios that sell for thousands. Most collectors' photos are not nearly as good as yours. How do you take the photos (studio set-up?) what type camera do you use? Digital photography was just getting started in the mid '90s, which was a deciding factor in creating my website. In the beginning, I used a Apple Quicktake 100, one of the first consumer-based digital cameras - it was great, no developing and instant results, but lacked in quality photographs. As, new cameras were introduced, I looked for something that would give higher quality results, and ended up using cameras from the Panasonic Lumix line of cameras, the FZ20 and FZ50, which is what I still use today. I'm not a professional photographer and generally have my camera set on automatic although I've learned so much about angles, reflections, shadows and lighting, and have been able to create some nice radio photos. I then remove the backgrounds on the photos with Photoshop to give all the focus to the radio itself. What is the "Classic Plastic Radio" period? What years does it encompass? Which was considered the first and which the last models to represent the era? Collectors of plastic radios has dramatically increased since I began collecting, driving prices for many through the roof. Their appeal is easy to understand when you look at Fada radios, for example. The Fada name is well known among vintage radio collectors. Fada has designed some amazing radios throughout their history, many of which are very sought-after by collectors today, some fetching thousands of dollars. In the late '30s, Fada introduced the plastic "Coloradio" series which incorporated fabulous deco lines, colorful plastics and chrome and brass trims. Some of their designs have become era icons, such as the 1945 model 1000 "Bullet", a striking design that has been reproduced over the years and become a familiar form in advertising and other products like clocks, cookie jars and miniatures. Many collectors only collect plastic radios, some from the "Classic Plastic" era of the '30 and '40s, which included Catalin plastic radios. Catalin radios are the most expensive radios, and today sell from $500 to $20,000! The catalin manufacturing process generated some beautiful marbling, with a finish that looks like glass. Red, green and blue catalin radios bring in top dollar. The slightest damage can reflect a huge difference in value, easily cutting a perfect examples value in half. Other types of plastic, such as Plaskon, Beetle and Bakelite are also very popular and much more affordable. Recently, plastic radios from the '50s with the "Atomic" design, have increased in popularity, as have the early plastic transistor radios. I've come to realize that terms used to categorize and describe plastic cabinets are very loosely tossed around. Frequent questions have been asked about the terms used in my radio descriptions, prompting some research... It turns out most of the terms used, such as Plaskon, Bakelite, Catalin and Beetle are not types of plastics at all, but tradenames. Although many radios were made with these particular tradename plastics, other radios were made with tradename plastics that few have heard of, which end up in the same, perhaps more popular, tradename category. Similar types of plastics are being generalized into a tradename category - confusing to say the least! The list of plastics tradenames from 1939 is long, as new recipes were being introduced weekly. How hard is it to find these old plastic radios? Are they becoming more rare? Plastic radios are becoming harder and harder to find in undamaged condition, as the radio collecting community grows and as people finish cleaning out their attics. Damage to plastic radios can never be brought back to their original state, with any repairs always being somewhat obvious, and bringing little back in value, compared to an undamged example. Basic advice to anyone looking for FADA or other plastic radios. As the San Francisco-made Remler radios with their Scottie dog logos are generally only found on the west coast, Fada radios are generally found on the east coast as Fada radios were made on Long Island. They are now getting spread out, thanks to the internet, but usually end up in collections, and to find attic-fresh radios, they are still only found in the general area of where they were made. For those of us in more rural areas, Ebay and other internet websites has become the only source for other-than-common radios. Newspaper want ads, 2nd hand & antique shops and rummage sales are still a possible source, but have become a less likely place to find great radios, as many sellers would rather reach thousands of prespective buyers by using Ebay, rather than depending only on walk-ins. Occasionally, stories still surface of great finds from a garage sale or shop. Is it possible to repair plastic radio cases? What sort of expertise is involved? What sort of cleaning material is best? Worst? How can a reader avoid ruining a plastic radio (what's the worst thing to do in restoration)? If readers find old plastic sets in a junk shop, antique store or yard sale, what should they look for to determine if a set is worth salvaging? Is there a "rule of thumb" as to what to pay for an older radio (condition, color, style, size, features, etc.)? What can be done about surface scratches, cracks, discoloring or other blemishes? The first thing to think about when buying an old radio is: Is it appealing to you? Is it eyecatching? Generally, the first impression "wow factor" you feel is the best guide. It is hard to set a "rule of thumb" as to what to pay for a radio you might find. There are some price guides specifically for plastic radios that will give a general idea of what you have found and its value. For the beginner, it is recommended to do research, as it can be hard to say if you might have found a real jewel. With plastic radios, any damage to the cabinet is most important, as cracks cannot be repaired. In some cases of very rare radios, minor damage can be overlooked, although in most cases, cabinet damage drops its value dramatically. Missing knobs and operability are not as important, as knobs can be replaced and the radio's electronics can be restored. Tubes are readily availble from dozens of sources on the internet. Painted bakelite radios' finish is very important. Most collectors can live with a few paint nicks, but if the radio needs a to be completely repainted, it will never realize the value of one with original paint, even when professionally repainted. It is important when restoring a radio's plastic surface to it's original glossy finish, to avoid most cleaners, as plastics can be easily irrepairably damaged by many household cleaners. I have found a great cleaner/polish called TR-3, a resin glaze automobile cleaner & polish available at many car parts stores or Amazon, something I've used for years. This is a great product for any plastic radio, from catalins and bakelites to painted radios. On painted radios, care must be taken to not polish to vigorously, or the paint will be removed down to the bakelite surface. A gentle polishing on painted radios will remove top layer discoloration and dirt and will shine like new. With catalin radios, care must be taken to polish the radio evenly. Catalin radios change from their original color over time, caused by oxidation from sunlight or smoke exposure. TR-3 will remove the top layer of discoloration, but care must be taken to polish to consistent color. It will also bring back the glossy finish to brown or black bakelite cabinets, if the cabinet has not been exposed to too much sunlight during it's life, leaving an unrestorable, pourous, dull finish. Sometimes, a layer of dirt or grease will have helped preserve the finish beneath. Detailing a radio by cleaning out the slightest evidence of dirt from every corner and crevice can make a huge difference in how it will display, and I've found that round toothpicks and a tootbrush are the most valuable tools to accomplish this, and will not scratch the surface. Great care should also be given when removing screws, knobs and the chassis from plastic cabinets, as many plastics have become very brittle over time. Tube heat from years of use will, in some cases cause "tube burn" to cabinets, caused by tube proximity to the cabinet. This can cause unrepairable color change to cabinets made from catalin, beetle or white plaskon. It is not generally noticable on brown or black cabinets, but will increase the fragility. Catalin and beetle cabinets shrink over time, and in some radios the chassis were so closely fitted, that the cabinet has shrunk around them, causing them to crack. Sometimes, they shrink to the point that it will crack the dial glass, which is a more better result than the catalin cabinet cracking, as dial glass replacement are generally available. In some cases the chassis it so tight and is impossible to remove due to the shrinking of the cabinet. I have heard of people softening the cabinet in the oven to free up the chassis, but not something I would recommend as worse damage could easily result. You collection looks like "showroom new." How much time does it take to restore the finish on a plastic set? Bringing back a plastic radio to a showroom or museum piece can easily take up to 8 hours of cleaning, polishing and detailing. The chassis appear to be the same or similar to other models of the period. Anything special about restoring the insides of the radio so that it plays like it did when new? With a general knowledge of electronics and perhaps the help of a vintage radio repair book, any radio should be able to be restored to playing condition. A few things can make this very difficult and something to watch for when purchasing old radios is the power transformer and pot metal pieces that have cracked. They can be very hard to replace. Generally damage to a power transformer can be identified by insulation wax that has oozed out the bottom. A rule of thumb to restore a radio chassis is to replace the electrolytic power capacitors, of which none have survived over time. This is also the reason to never plug in a radio when first purchased as these failed components can do serious damage to other components and tubes. Some purists insist on leaving the old caps in place to preserve the original look of the chassis and add replacements around them. Also, it is a good idea to replace the original paper capacitors which also have deteriorated over time. Do you possibly have a favorite? If so, which one and why? It's hard to pick a favorite from my collection - I could probably narrow it down to a couple dozen, as there are some wonderful unique features to each. The eye-catching colorful plastics, unique cabinet designs, models that featured pushbutton tuning or the familiar green glowing tuning "eye" tube have always drawn me towards them. I've always loved the 1930s Zenith radios which are very popular with collectors due to their beautiful large round black dials. They aren't particularly rare, but the demand is so high for these, that their prices continue to rise. There are so many models featured on you web page. How many such individual models were made? Is there any way to know? Whatever happened to some of those brands (Capehart, DeWald, Detrola, etc.)? When radio was first introduced to every household in the 1920s, hundreds of new radio manufacturers were springing up, many which did not survive but a few years. Others continued to flourish and some are still alive today. Many companies included a new full line of radios, introducing 10-25 new models each year. A wide range of new models included portables to large living room consoles and economy models to high-end, high tube-count for the more affluent of the day were available. Is there a Holy Grail of plastic radio collecting (a particular model that certifies a collection as complete)? A few plastic radios could be considered "Holy Grails" from the 1930s Air King "Skyscrapers" to some catalin radios, although some of these radios cannot be realistically realized as only a few are known to exist. A few models should be included in any "complete" plastics collection, including the Fada 1000 "Bullet" and the Canadian catalin Addisons. How is the plastic in these radios different from that used today? Manufacturing methods and costs have changed the plastics industry that now uses different plastics, moving away from bakelite and catalin. It's hard to tell from the photos, but what are the relative sizes of these sets? Midget radios usually are considered those from 5 to 7 inches wide. The majority of US-made plastic radios from the 30s and 40s are mid-sized ranging from 8 to 12 inches wide. Large bakelite radios measuring up to 17 inches wide (or tall) are less numerous, and more frequently found in European or Australian radios. I notice that you offer a few radios for sale. How do you determine which ones you'll sell? The radios I sell are generally duplicates, or ones I have no affinity for or hope to upgrade to a better example...or ones that I might have a sour taste in my mouth from because of a purchase that didn't go well - undisclosed damage or shady seller. Born in the Middle East in 1957 to American missionaries, Merrill inherited the collector gene from his philatelist Grandfather. Fascinated with electronics and radio at an early age, he added radios and record albums to the long list of items he collected. Following his musical interests, Merrill, with his wife Brenda, hosted a college radio station blues show as disc jockeys for nearly ten years in the 1980s on KTEQ-fm in Rapid CIty, South Dakota. His interest in radio grew, and after accumulating over 12,000 LPs, he shifted his resources to locating old tube radios. He often refers to his collecting as a disease, an affliction he can't shake. Merrill's small collection has grown to nearly 500 radios, both wood and plastic, many hunted down at rummage sales, auctions and 2nd hand stores. The internet opened up communications with the world, and Merrill began corresponding with dozens of collectors all over the globe. In 1995 he created the website, ClassicRadioGallery.com where he shares his radio images and knowledge. The site has become well-known to collectors around the world and many of his photographs have appeared in world-wide publications. 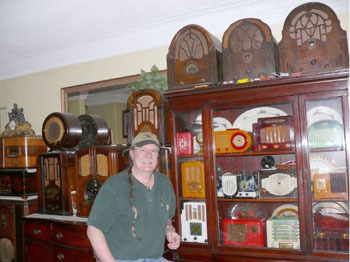 Merrill loves bringing these old radios back to life, but found his interests within the radio hobby have evolved from the internal workings, to the cabinet designs. His further interests in computers and photography have become evident in his work on the web, and it has all culminated into a 25 year career in the IT Department for the Rapid City School District with numerous networking certifications. Merrill spends much of his time deep in the back woods of the Black Hills of South Dakota capturing its beauty with his digital photography, of which examples can also be found on his radio web site. See many more beautiful radios inside Classic Radio Gallery!